Largest city of the state of Tennessee in the United States of America. Although the year 1845 is designated as the date of the earliest settlement of Jews in Memphis, it appears that a few had lived there temporarily before that time. Among the most prominent of the earlier settlers was Joseph J. Andrews, a former resident of Charleston, S. C., and Philadelphia. 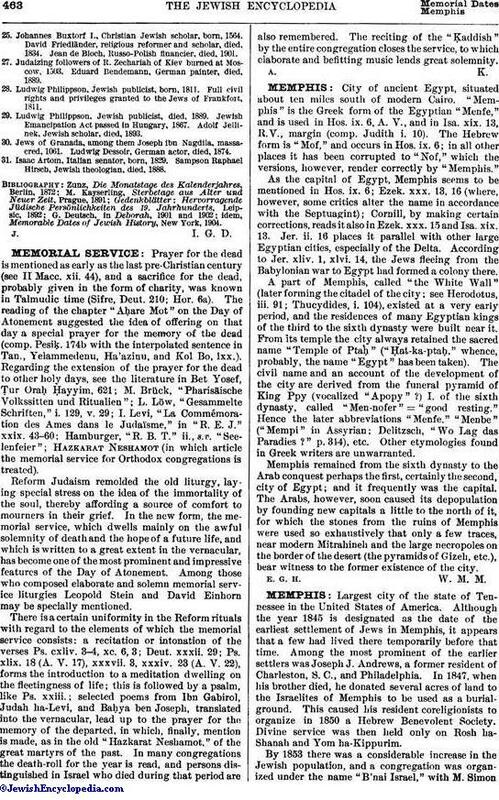 In 1847, when his brother died, he donated several acres of land to the Israelites of Memphis to be used as a burial-ground. This caused his resident coreligionists to organize in 1850 a Hebrew Benevolent Society. Divine service was then held only on Rosh ha-Shanah and Yom ha-Kippurim. By 1853 there was a considerable increase in the Jewish population, and a congregation was organized under the name "B'nai Israel," with M. Simonas president and Solomon Hess as secretary. A hall was leased in a building on Front street; and Jonas Levy, formerly of Little Rock, Ark., was engaged as ḥazzan and shoḥeṭ. A Hebrew school, under the direction of the Rev. L. Sternheimer, was established, and a lot was bought with $2,000 donated by Judah Touro in 1853. At the beginning of 1858 greater interest was manifested in communal affairs. A building, known as "The Farmers' and Mechanics' Bank," was purchased and dedicated (March 26, 1858) as a house of worship. At the same time the Rev. J. J. Peres was elected ḥazzan. In 1860 the Rev. Simon Tuska of Rochester, N. Y., was chosen as rabbi. His views were those of moderate Reform; but when an organ, a mixed choir, and family pews were introduced into the synagogue a considerable number of members seceded and formed (1862) an Orthodox congregation called "Beth-El Emess." The numerical strength of the B'nai Israel congregation was reduced; but the members held their own, and when, after the close of the Civil war, many Israelites from the West and the East settled in Memphis, most of them affiliated with the Reform congregation. Rabbi Tuska died suddenly on Dec. 30, 1870; and the congregation elected as his successor the Rev. M. Samfield, formerly rabbi of the B'nai Zion congregation, Shreveport, La. He was installed Aug. 15, 1871, and still (1904) occupies the rabbinate. Some years later a consolidation of the Beth-El Emess congregation with B'nai Israel was effected, and in 1883 a lot on Poplar street was bought for the site of a temple. The building was dedicated Jan. 18, 1884. Another Orthodox congregation, established in 1862, had no permanent place of worship until 1890, when the members bought a church and converted it into a synagogue, giving their organization the name of "Baron Hirsch Congregation." The number of members is at present (1904) eighty-five. 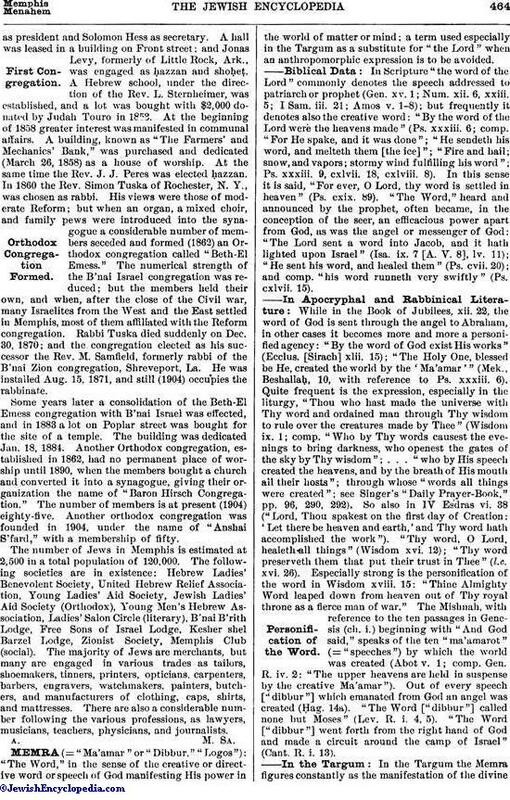 Another orthodox congregation was founded in 1904, under the name of "Anshai S'fard," with a membership of fifty. The number of Jews in Memphis is estimated at 2,500 in a total population of 120,000. The following societies are in existence: Hebrew Ladies' Benevolent Society, United Hebrew Relief Association, Young Ladies' Aid Society, Jewish Ladies' Aid Society (Orthodox), Young Men's Hebrew Association, Ladies' Salon Circle (literary), B'nai B'rith Lodge, Free Sons of Israel Lodge, Kesher shel Barzel Lodge, Zionist Society, Memphis Club (social). The majority of Jews are merchants, but many are engaged in various trades as tailors, shoemakers, tinners, printers, opticians, carpenters, barbers, engravers, watchmakers, painters, butchers, and manufacturers of clothing, caps, shirts, and mattresses. There are also a considerable number following the various professions, as lawyers, musicians, teachers, physicians, and journalists.